The fourth pillar of Islam is fasting. Allah prescribes daily fasting for all able, adult Muslims during the whole of the month of Ramadan, the ninth month of the lunar calendar, beginning with the sighting of the new moon. Exempted from the fast are the very old and the insane. On the physical side, fasting is from first light of dawn until sundown, abstaining from food, drink, and sexual relations. On the moral, behavioral side, one must abstain from lying, malicious gossip, quarreling and trivial nonsense. Every year, more than one billion Muslims around the globe observe the importance of the month of Ramadan. This time of the year is a time for reflection, devotion to God, and self-control. During the month of Ramadan, Muslims show their devotion to God by fasting, or abstaining from food. Many religions encourage some kind of fasting for religious purposes. For instance, Catholics give up meat for Lent and Jews fast during the holiday of Yom Kippur. For Muslims, fasting is a very important component of Islam. The benefits of fasting for Ramadan are numerous. The most important, though, is the idea that through the self-control of fasting one can pay special attention to his spiritual nature. Ramadan is an important time for Muslims, not simply because it helps develop a closer relationship with God, but also because Ramadan is a time to think about those who are less fortunate. Another goal of fasting for Ramadan is to experience hunger in sympathy for those without food. It is a way that many Muslims learn thankfulness and appreciation for what they have. In this article, we will examine the meaning of Ramadan, the tradition of fasting, how the time of Ramadan is determined, Eid al-Fitr (the end of Ramadan) and the benefits of observing the holiday. amadan is the ninth month of the Islamic calendar. Because Islam uses a lunar calendar, Ramadan begins and ends at a different time each year. The way the lunar calendar works is that the beginning of each month begins with the sighting of the new moon. The lunar calendar is about 11 days shorter than the solar calendar used in much of the Western world. To learn more about the various calendars of the past and present, see Calendar Zone. The start of Ramadan each year is based on a combination of sightings of the moon and astronomical calculations. In the United States, many Muslims adhere to the decision of the Islamic Society of North America on the start of the holiday. The end of Ramadan is determined in a similar way. For Muslims, Ramadan is a month of blessing that includes prayer, fasting and charity. The meaning of Ramadan goes back many centuries, to about 610 A.D. It was at this time, during the ninth month of the lunar calendar, that Muslims believe God, or Allah, revealed the first verses of the Qu'ran, the holy book of Islam. According to Islam, a caravan trader named Mohammed was walking in the desert near Mecca. This occurred in what is now Saudi Arabia. One night a voice called to him from the sky. It was the angel, Gabriel, who told Mohammed he had been chosen to receive the word of Allah. In the days after, Mohammed began speaking the verses that would be transcribed as the Qu'ran. At many mosques, during Ramadan, verses from the Qu'ran are recited each night. The prayers are known as tarawih. By the end of Ramadan, the complete scripture has been recited. Ramadan is a time when Muslims can connect with the teachings of the Qu'ran. 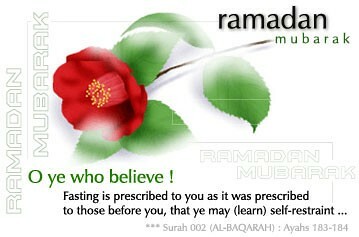 The main component of Ramadan is the fast. In the next section, we'll find out how Muslims practice the fast of Ramadan and the significance of the fast to the Islamic faith. During Ramadan, Muslims practice sawm, or fasting. Of course, no one is required to fast for an entire month. The practice of fasting during Ramadan means that Muslims may not eat or drink anything including water while the sun is shining. Fasting is one of the five pillars or duties of Islam. As with most other religious practices in Islam, Muslims participate in the fast from the age of 12. One of the most important aspects of the Ramadan fast is called niyyah. Niyyah literally means "intention." Muslims must not simply or accidentally abstain from food; they must achieve the requirement of niyyah. To achieve this requirement, a Muslim must "intend in [his] heart that [the fast] is meant to be a worship for Allah alone." So, if someone fasts for political or dietary reasons, he would not achieve niyyah. In fact, according to scripture, "Whoever does not make niyyah before dawn, would not have fasted." The determination to fast is equal in importance to the fast itself. In much of the Muslim world, restaurants are closed during the daylight hours of Ramadan. Families wake up early, before the sun rises, and eat a meal called sohour. After the sun sets, the fast is broken with a meal called iftar. Iftar often begins with eating dates and sweet drinks to give fasting Muslims a quick energy boost, and it is a rich meal. It can include any type of food, but the dessert almost always includes konafa or qattayef. Konafa is a cake made of wheat, sugar, honey, raisins and nuts. Qatayef is a similar cake, but it is smaller and is folded to encase the nuts and raisins. In between the two meals, the night-time iftar and the pre-dawn sohour, Muslims can eat freely. Fasting is so important to Muslims for a number of reasons. First, when you are not paying attention to your mortal needs such as food, you may be able to become more in tune with God and your spiritual side. Also, the fast serves to remind Muslims of the suffering of the poor. This idea reinforces the importance of charity during Ramadan. Fasting gives Muslims an opportunity to practice self-control and cleanse the body and mind. Many cultures and religions use fasting for this purpose. During Ramadan, fasting helps Muslims with their spiritual devotion as well as in developing a feeling of kinship with other Muslims. As the history goes, Ramadan is the month in which Allah contacted the prophet, Mohammed, to give him the verses of the holy book, or Qu'ran. As such, praying during Ramadan is especially important. Muslims say nightly prayers whether it is Ramadan or not, but the taraweeh, or Ramadan nightly prayer, carries additional weight. According to scripture, "Whoever observes night prayer in Ramadan as an expression of his faith and to seek reward from Allah, his previous sins will be blotted out." Thus, the Ramadan nightly prayer, after a day of fasting, serves the purpose of eradicating the sins that have been previously committed. 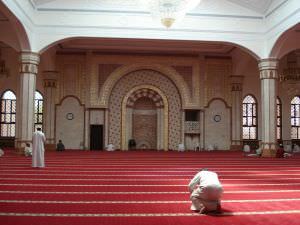 In this way, the nightly prayer is an important element of the rituals of Ramadan. At the end of Ramadan and before the breaking of the fast, Muslims say takbeer. The takbeer is a statement indicating there is nothing in the world that is bigger or greater than Allah. Takbeer is always said when a Muslim completes an important task, as in the completion of the fast of Ramadan. Translated, the takbeer exclaims, "Allah is the Greatest, Allah is the Greatest. There is no deity worthy of worship but Allah, and Allah is greatest. Allah is the Greatest and all praise is due to Allah." It is recommended that men say the takbeer out loud and women say it silently. Takbeer is a sign that the festivities of Eid Al-Fitr have begun. It is a joyful statement of faith and accomplishment. Ramadan is considered the most joyful month of the year, and the month ends with the greatest celebration of all, the breaking of the fast, Eid al-Fitr. Around the world, Muslims celebrate with lights and decorations. In Egypt, "fanoos" -- lanterns made of tin and colored glass -- decorate streets and mosques. In the past, children played with the lanterns in the streets. In many areas, the current age of cars makes this unsafe, but the tradition is still practiced in homes and at Eid al-Fitr gatherings. During the celebration, people dress in their finest clothes, decorate their homes with lights, give treats to the children and visit with friends and family. According to many, a sense of generosity and gratitude are a major part of Eid al-Fitr. Charity and doing good deeds is a very important part of Ramadan. The month will often consist of Muslims helping to feed the poor and making contributions to their mosques. strengthens one's ties with Allah and trains the soul to observe duties of devotion in accordance with the teachings of the Qur'an. promotes the principle of sincerity by keeping the individual away from arrogance and showing off. promotes good character, particularly truthfulness and trustworthiness. encourages the individual to do away with bad habits and change his or her circumstances for the better. enhances generosity, hospitality and giving to charity. reinforces feelings of unity and brotherhood among Muslims. instills orderliness and observance of the value of time. serves as an opportunity for children to perform acts of obedience and to practice Islamic acts of worship. offers the chance to balance one's attention to both physical and spiritual needs. During the month of Ramadan, Muslims gain more than a cleansing of the body and mind. Muslims feel that they are doing the work of getting closer to Allah through prayer, and are becoming more compassionate people by experiencing hunger, learning about the suffering of the poor. The fast of Ramadan is a central experience in the Islamic religion. To learn more about Ramadan, the rituals and history, and about Islam in general, check out the links on the next page. With Ramadan right around the corner, it’s time to start gearing up and adjusting our schedules accordingly. One of the things we have to plan for during Ramadan is Tarawih. Now I’m not going to delve into a fiqh discussion in regards to Tarawih (plus there’s some video coming your way soon InshaAllah). What I’d like to talk about is the potential impact that Tarawih can have, particularly on children. One question most Imams, Shuyukh, Du’at, etc get asked is, “How and when did you know this is what you wanted to do?” Often this question is asked by parents in order to get an idea of how to get their kids interested in similar things. Well my answer to this question has to do with attending Tarawih in Ramadan. Alhamdulillah since the age of about 5 my father used to take me to Tarawih every night in Ramadan, even on school nights. Around the time I was 8 I remember being amazed by the Imam’s recitation of the Qur’an from memory in Tarawih. I even told my father that I want to be able to do what he does. So bi’idhnillah when the opportunity presented itself to go and memorize the Qur’an, I jumped at it and insisted that I be allowed to go. Keep in mind that this involved traveling overseas at the age of 10. Alhamdulillah, since then one thing Allah has granted me the ability to do consistently is lead Tarawih every Ramadan. This was the beginning of my journey down the road of seeking knowledge and serving the Deen. So I recommended the same thing to my community and last year there was a family who regularly attended Tarawih all Ramadan and even stayed afterwards to listen to the Tafseer sessions. By the end of Ramadan they came to me with their 10 year old son saying that he insists he wants to memorize the Qur’an - and asking advice for how to go about doing it. It’s really simple to understand, take your son to NASA and on the way home he’ll tell you that he wants to be an astronaut when he grows up. Take your daughter to the zoo and now she wants to be a veterinarian. Same thing goes for sports and athletes, Tiger Woods’ father starting taking him to the golf course at an early age. So if we want our children to develop a love for the Qur’an and knowledge in general and aspire to be students of sacred knowledge, then we have to introduce them to it. InshaAllah no time better than the present, use this Ramadan and Tarawih wisely. It is that time of the year again. Ramadan has begun to signal it's imminent arrival. For most, that might imply a dread of fasting longer, hotter days. For others, it might mean saving more to stock up their freezers. For some lucky people, it might indicate the time to start making travel arrangements for performing umrah or itikaaf in Islam's holy sites in Saudi Arabia. For most, however, including me, it implies preparing for project "Yearly Zakaah: Calculation and Discharge". It gains more rewards - multiplied by 70 times, at the very least. That is why it can be given in advance, during Ramadan. It is imperative, on the other hand, that if it has become due before Ramadan, it should be given at once, and not delayed in the hope for more reward. It is easier to keep track of Zakaah if one has the habit of discharging it in a prominent Muslim month, i.e. the latter's arrival provides a convenient reminder to start planning how much and where, to pay off one's Zakaah. In the current scenario, when the economic crisis and global "credit crunch" has left many Muslims struggling financially, and like other people all over the world, striving to hold on to their jobs, save and scrimp any extra money they possibly can, look for alternative modes of earning and sources of income, and to spend very cautiously, generating enough liquidity to pay off one's Zakaah becomes an added concern. All extravagant expenditures have started to be curtailed, or so we like to think, in such a scenario. So the problem with giving Zakaah this coming Ramadan is, to a great extent, the challenge of generating enough extra cash to be able to pay off the due on our assets. People who nowadays own lavish homes, individual cars for members of the household, electricity-bill-thumping appliances such as washers, driers, air conditioners, microwave ovens, dishwashers, hair-irons, kettles, coffee-makers and heaters, and have their children enrolled in expensive private schools are, to put it mildly, in a fix. They can no longer afford their lavish lifestyle yet find it difficult to step down a few rungs on their social ladder in order to curtail their extravagant expenditure. "How do we pay the Zakaah on our gold jewelry when we do not earn money?" Most women innocently assume that they are absolved from paying Zakaah on their gold because of this reason, or that it is primarily and completely their husbands' responsibility, and not their concern at all. They assert that the husband should, therefore, always pay the Zakaah on their gold. Other women come up with certain ahadith as 'proof' that Zakaah is not to be paid on gold that is in regular use by them i.e. that which they wear. Others still, come up with other 'ahadith' claiming that Zakaah is not due on gold at all. Others, still, - the rarer lot - suggest that women should save money from their household budget each month to pay off the yearly Zakaah on their gold. Not one - I repeat - not one woman student have I come across to this day, who would give the suggestion that women sell off some of their gold jewelry to generate the required amount of Zakaah on it. Has your jaw dropped? Are you stunned? If so, why, may I ask? Sadly, this is the reaction of most Muslim women when I suggest this solution. However, I do not understand this reaction at all. Why is the idea of selling gold to generate money for sadaqah in the way of Allah so shocking or unthinkable? Is it not what Allah has ordained? Was it not the suggestion of our Prophet Muhammad [صلی اللہ علیہ وسلم] directed specifically at Muslim women, to give a lot of sadaqah/charity from their ornaments? Narrated Abu Said Al-Khudri: "On 'Eid Al-Fitr or 'Eid Al-Adha, Allah's Apostle (PBUH)went out to the Musallah. After finishing the prayer, he delivered the sermon and ordered the people to give alms. He said, "O people! Give alms." Then he went towards the women and said. "O women! Give alms, for I have seen that the majority of the dwellers of Hell-Fire were you (women)." The women asked, "O Allah's Apostle! What is the reason for it?" He replied, "O women! You curse frequently, and are ungrateful to your husbands. I have not seen anyone more deficient in intelligence and religion than you. O women, some of you can lead a cautious wise man astray." Then he left. And when he reached his house, Zainab, the wife of Ibn Masud, came and asked permission to enter. It was said, "O Allah's Apostle! It is Zainab." He asked, 'Which Zainab?" The reply was that she was the wife of Ibn Masud. He said, "Yes, allow her to enter." And she was admitted. Then she said, "O Prophet of Allah! Today you ordered people to give alms and I had an ornament and intended to give it as alms, but Ibn Masud said that he and his children deserved it more than anybody else." The Prophet replied, "Ibn Masud had spoken the truth. Your husband and your children had more right to it than anybody else." "O women! Give alms, even from your ornaments." ...Zainab used to provide for 'Abdullah and those orphans who were under her protection. So she said to 'Abdullah, "Will you ask Allah's Apostle whether it will be sufficient for me to spend part of the Zakaah on you and the orphans who are under my protection?" He replied "Will you yourself ask Allah's Apostle?" (Zainab added): So I went to the Prophet and I saw there an Ansari woman who was standing at the door (of the Prophet) with a similar problem as mine. Bilal passed by us and we asked him, 'Ask the Prophet whether it is permissible for me to spend (the Zakaah) on my husband and the orphans under my protection.' And we requested Bilal not to inform the Prophet about us. So Bilal went inside and asked the Prophet (PBUH) regarding our problem. The Prophet asked, "Who are those two?" Bilal replied that she was Zainab. The Prophet said, "Which Zainab?" Bilal said, "The wife of 'Adullah (bin Masud)." The Prophet said, "Yes, (it is sufficient for her) and she will receive a double reward (for that): One for helping relatives, and the other for giving Zakaah." The ahadith above give clear proof of that fact that women should donate their ornaments in charity, and particularly if their husbands are in need. In fact, women may give Zakaah, the obligatory charity, to their husbands first, if the latter are deserving of it. Was it not the way of our mothers and aslaaf (pious predecessors) to give away gold or silver in sadaqah? When our mother, Umm Habibah [may Allah be pleased with her], received the glad tidings of Prophet Muhammad's (PBUH) marriage proposal for her in Abyssinia, she gave the ornaments she was wearing, then and there, to the slave-girl who had brought her this good news. Then why do we Muslim women feel so reluctant to convert our gold ornaments to liquid cash in order to discharge an obligation of Islam that is one of its most fundamental pillars? Simple answer: We love gold. Oh boy, do we love it! We love to wear it, flaunt it, and store it for our sons' and daughters' marriages. We pass down cherished heirlooms in order to maintain familial traditions. The more antique the jewelry is, the more we hold it close to our hearts. Most women are in the habit of gradually collecting ornaments over the years. The reason why jewelers' shops do roaring business worldwide is the symbol of this attachment of the female hearts to anything that twinkles, shines and is worth millions. I admit I was very surprised on visiting Madinah for the first time, to see that even the majority of shops outside Masjid-e-Nabawi were those selling gold jewelry. So how can Muslim women help their husbands and/or brothers and sons out this year, in paying off their Zakaah? Simply, convert some of your trinkets and/or rings, bangles, bracelets or earrings to liquid cash, and use that cash to give off Zakaah. I wouldn't be preaching this had I not done it myself. I can promise you that you'll feel tremendous closeness to Allah and serene joy of faith as a result, as long as you do not brag about your sadaqah to anyone; that is, you do not waste what you've done. I also happen to know of other women who have similarly donated their jewelry, wedding clothes or other precious possessions; they do not, in any way, feel guilty or regretful for having done so. Life is short; so many chances of doing sadaqah pass us by, yet we continue to hold on to our clothes and jewelry as if they'll stay with us forever. Wake up, O Muslimah! Remember that your permanent abode is the Hereafter, with the only permanent joys and blessings being those given to the dwellers of Paradise; therefore, strive to attain that long-lasting abode by letting go of just a wee bit of the things you love in this passing, worldly life, and then taste the sweetness of faith, and the high levels of taqwa that Allah will bless you with, as a consequence.